A man swimming and spearfishing in the lagoon at the Mosquito Coast area of San Pedro – which was reportedly filled with debris – is lucky to be alive after he was attacked by a crocodile at about 8:00 Friday morning. The man struggled with the animal, which eventually released him and escaped. The victim was taken to the San Pedro Polyclinic, where he was treated and later released. Chenot Rose, an expert on crocodiles and alligators, of ACES, San Pedro, told reporters that the crocodile bit the swimmer in defense because he was invading his territory. Rose does not believe the animal was hunting for food, because the attack on the swimmer would have been fatal if that had been the case. 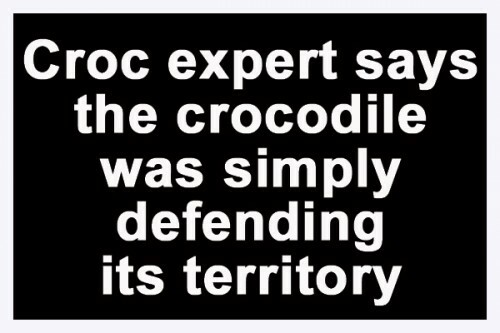 He said that when crocodiles hunt for food, they have a deadly bite and grip, but when they are threatened, they snap in self-defense and leave the area. Rose said that while the man’s injuries were superficial, the wetsuit he was wearing helped to prevent him from sustaining worse injuries.